﻿ Best Price on Hotel Seranta Brisas de Bavaro in Punta Cana + Reviews! Offering an outdoor swimming pool, spa and free Wi-Fi, Hotel Seranta Brisas de Bavaro is 20 minutes from Playa del Cortecito, while Bavaro’s center is 12 minutes by car. 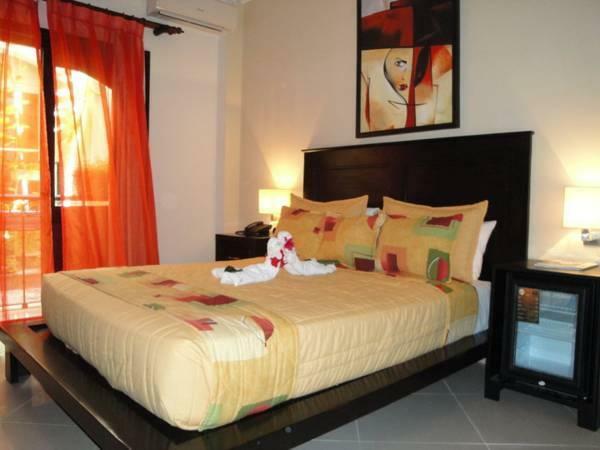 All rooms at Hotel Seranta Brisas de Bavaro are air-conditioned and feature a flat-screen TV and a mini-bar. The private bathrooms have a shower and hairdryer. Continental breakfast is available in the morning. Guests may find several food options including local, Italian and French cuisine in the shopping center next to the property. Various bars and discotheques are within walking distance. Barcelo Bavaro Golf Course is 4 mi from the property, while Punta Cana International Airport is 25 minutes’ drive away. Please note that the same credit card used to make reservation is needed at check in, card must be embossed. Guests are required to show a photo ID and credit card upon check-in. Please note that all Special Requests are subject to availability and additional charges may apply.